On Saturday, March 24th, the Space Senior Design students set out for their first, full-scale tests of the rocket and controller designs they’ve been working on for the past seven months. A two-semester long course sequence, Aerospace Vehicle Design I and II (MAE 480/481), gives aerospace engineering undergraduates the option between a focus on aircraft or space. During the first semester, the space students spend most of their time designing, manufacturing and launching the subscale model. 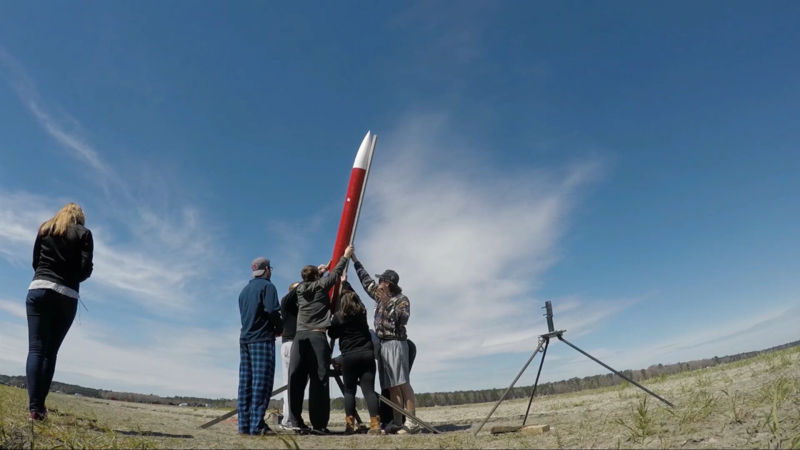 The second semester is dedicated to putting it all together for the full-scale launch, which for this year’s class, was quite a success and doesn’t happen every year (see video of launch below). The full-scale launch is used to see how well the rockets perform, and whether or not the controller was able to actively guide the rocket’s roll rate. Using the data obtained during the launch, the vehicle and controller designs will be improved for the final launch at the end of April. The space senior design project builds upon the course material and problem-solving skills students have learned throughout their time in the MAE Department at NC State, preparing students for their future in the aerospace field.